I was going to post a longer piece I wrote, “Oberon.” It’s about 1,000 words, but I really need to work on it some more. I originally wrote it for Chuck Wendig’s Terrible Minds Flash challenge, but I decided not to post it, because it needed more than 1,000 words. Instead, I wrote a story about Oliver today for Flash!Friday. The setting had to be in a kitchen. 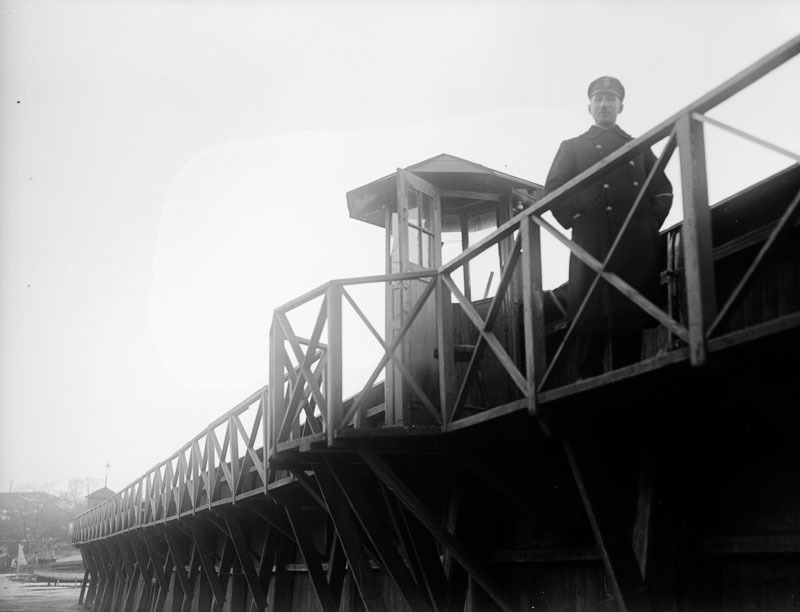 And here is the photo prompt of a Prison Guard from the public domain. “Oliver, chop up the onions,” Momma said. She stood near the stove, stirring the soup. Poppa was on duty again, and had been for the last two days. Momma worried about him. The phone was secured to her ear, the cord cutting a trail through the kitchen. Tears streamed down Oliver’s face. He wiped his eyes with the sleeves of his shirt. His sister toddled in, and Oliver pushed her out of the galley kitchen that seemed crowded with him, Momma, and the voice of Aunt Tessa coming through the phone. “Is this enough?” Oliver asked, his eyes red-rimmed. The tears burned his eyes now. He thought of Poppa with a pencil stuck in his neck as he scraped the onions into the soup. How do you do so much with such a small word count? From the title to the knowledge that Oliver is chopping onions, to simply knowing that hearing about the danger your father is in every day … I can feel the buried emotion from here. Lovely! It took me awhile to get a hang of it, but that’s what I like so much about flash. It shows you how to convey the necessary information and get rid of all the unnecessary. In essence, it’s made me a better writer. Thanks for your kind words! Chuck Wendig is a hoot, I need to start reading his blog more often. Maybe when A_Z has completed I will have time for a few of his Flash Friday Challenges. I enjoyed your piece and your ability to write so very concise. Great work on your posts. Thank you for stopping by! I’m a little late on my P blog today, but about to make it. I have to agree with Debs in that I don’t know how you convey so much so succinctly either! You are amazing, and I enjoy reading your work every time! Thank you! Thank Helen! That means so much to me. I’m glad you’re enjoying it.